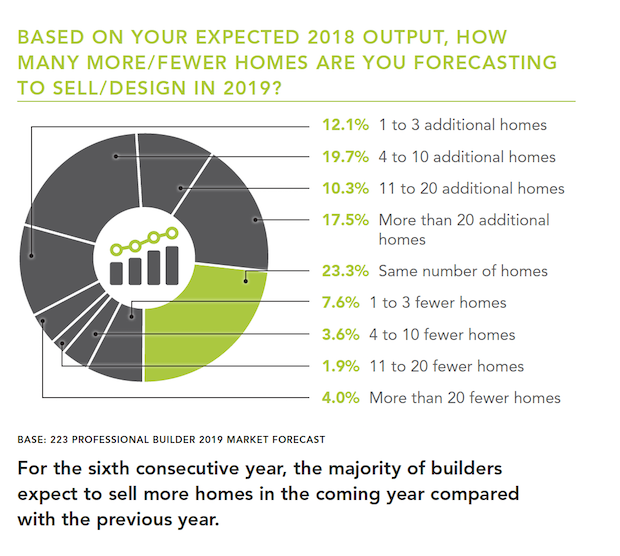 Members of Builder Partnerships once again participated in the Professional Builder 2019 Market Forecast, sharing numbers from 2018 and forecasts for the new year. Judging from the numbers, most home builders had a good year overall, and more than 75 percent were optimistic for 2019. You can see the full article and the survey results here. Given the softening of the market and the increase in mortgage interest rates in the last two months of the year, Builder Partnerships sent an abbreviated version of the survey to members in December to see if their projections had changed since the end of the third quarter. The results were significant and insightful. First, we asked, “Considering projections from the beginning of the year, how did your 2018 numbers change?” About a third of Builder Partnerships members said their 2018 numbers stayed about the same; the variances came among builders who saw increases and decreases. In the original survey, 14.29 percent of member builders said their 2018 numbers had increased more than 5 percent from their projections at the beginning of the year. By the end of the year, that percentage had dropped to 8.2 percent. In the original survey, about 18 percent of builders said their numbers had decreased more than 5 percent. By December, that number had more than doubled, to about 41 percent; builders cited delays caused by weather, slow completion of development infrastructure and lot delivery, and waiting for governmental approvals. We then asked member builders about their projected revenue in 2019. Again, the results were quite interesting, with many builders now predicting higher revenues for 2019 than they had earlier thought. In the original survey, about 1 in 5 builders projected their 2019 revenue would be the same as 2018. By December, that had increased to 1 in 4. Of the builders that forecasted an increase in revenue, the percentage that predicted an increase of 10 percent or more jumped from about 21.69 to 33.87, a full third. The percentage of builders that predicted a 1-3 percent increase dropped from 14.29 percent to 9.68 percent; the percentage of builders predicting a 3-7 percent increase plummeted from 22.75 percent to 6.45 percent, and those predicting a 7-10 percent increase dropped from 10.5 to 4.8. Some builders predicted a decrease in revenue. In the original survey, only 2.12 percent of builders predicted a decrease in revenue of 10 percent or more; by December, that number had jumped to 12.9 percent. Additionally, 3.17 predicted a revenue decrease of 1-3 percent; by December, that had increased slightly to 4.84 percent. The percentage of builders predicting revenue declines of 3-7 percent and 7-10 percent went down, from 2.65 and 2.12 percent, respectively, to 1.61 percent. In their comments, one builder noted that sales are expected to be “solid but tepid compared to 2017 and early 2018.” Another felt that the company is turning a corner with “nice presales” and another said their developer is ahead of schedule on the next phase and two more developments are ready now. Finally, we asked them to take a second look at their general sentiment for home building in their market in the new year. Through both strong and soft housing cycles, members of Builder Partnerships and clients of Shinn Consulting consistently lead their markets and outperform industry benchmarks for sales, operational efficiency, and profitability. Contact us today to learn how we can help your home building business succeed.